Dr. Seuss was dared to write a book with only 50 different words—3 years and only 50 different words later, Green Eggs and Ham was published. Children are usually most interested in learning about the letters in their own names. Turn words into works of art by “writing” with macaroni, dried beans, your child’s favorite cereal, or another item from the kitchen. Kimberly Oliver Burnim, a kindergarten teacher for more than a decade, has been acknowledged for her commitment to teaching excellence as United States National Teacher of the Year, and as one of 2011’s “28 Most Influential Black Women” as named by Essence magazine. 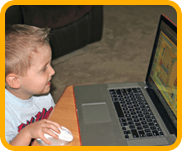 Ms. Burnim, Senior Curriculum Advisor at ABCmouse.com for more than five years, guides the design of developmentally and academically appropriate content and learning activities that help build a strong foundation of essential concepts and skills important for early learners. Let’s start with a basic question: How would you define phonics for our readers? Kim Burnim: Phonics is simply the relationship between letters of the alphabet and the sounds that those letters stand for in written words. For example, when we see the letter b in a word, it usually stands for the “b” sound that we hear at the beginning of the words “boy” and “bicycle”—that’s an example of phonics. Kim Burnim in her kindergarten classroom. How important is it to teach phonics to children? Kim Burnim: Learning phonics helps children learn to read and spell words accurately and quickly. 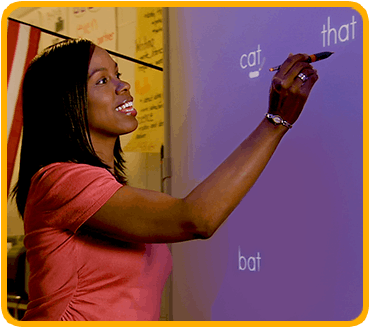 When a child is taught phonics, he or she can use that knowledge to decode unknown words. Why is it called decoding? At what age should children learn phonics? Kim Burnim: Phonics is taught in the early years because it is an important part of learning how to read. 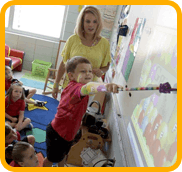 Most instruction typically occurs from kindergarten through second grade. In kindergarten, children should learn the sounds of individual letters, and in the first and second grades they should be learning more advanced principles of phonics, such as rules for short and long vowel sounds. But it’s important to keep in mind that children learn at different rates. Some children need very little phonics instruction; others need more. 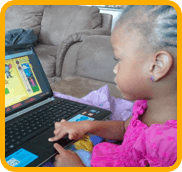 Some children are ready to start learning the sounds of the letters prior to kindergarten, and some children do best with more advanced phonics instruction all the way into third grade. And research has shown that older children who have difficulty reading can also benefit from phonics instruction—which shows just how important it is for children to learn phonics early on. What should a child do to start to learn phonics? Kim Burnim: Actually the first step is just learning the names of the letters of the alphabet—research has shown that when children know the names of the letters, they are better able to learn about the sounds that the letters represent. It’s always a good idea to start with the letters in the child’s name, because this makes the learning more meaningful. For example, you can pick a letter from your child’s name and help him or her circle it each time it is found on one page of a magazine. Or you can help your child find the letters of his or her name in an alphabet book. You can also help your child make letters of their name with playdough, or use finger paint or sand in a sandbox to practice writing the letters. After that you can just keep pointing out letters and talking about their sounds—in books that you read, on signs, and so on. As you do this, you might want to keep in mind that in school we usually start with the most common sounds for each letter, rather than try to teach all of the sounds that each letter represents. Can you give an example of what you mean by the “most common sound”? Kim Burnim: Of course. The letter c, for example, sometimes stands for the same sound as the letter k, as in the word “cat,” and sometimes stands for the same sound as the letter s, as in the word “city.” The most common sound for the letter c is the “k” sound, so that’s what we teach children first. Another example is the letter a—sometimes it represents the short a sound, as in the word “cap,” and sometimes it represents the long a sound, as in the word cape. We usually teach the short a sound first, because that’s more common, and then teach the long a sound later on. So these are all things to think about once a child starts to learn letters and their sounds. But there are important steps of learning to read that come prior to phonics. Kim Burnim: Prior to phonics instruction children should have many opportunities to listen to and read books. One of the best things that a parent can do is to read with the child every day. This should start at an early age. Many experts believe that it is never too early to read with a child. Even infants benefit from hearing books read out loud. Reading and listening to books helps young children understand important ideas about books that are called concepts of print, such as the fact that you read text front to back, left to right, and top to bottom, and other important features of books. It also introduces them to rich language, which refers to vocabulary words that children might not hear in normal conversation. This is all part of the foundation needed for phonics instruction. Reading experts generally agree that phonics is one of many important elements of learning to read, along with familiarity with books, oral vocabulary (which is the collection of words that a child understands and can use in conversation), understanding of the parts of stories, and other factors. An approach that addresses all of these skills is often referred to as balanced literacy. Kim Burnim: Well, a balanced literacy approach also emphasizes sight words—those are words that children should learn to recognize without sounding them out, such as the words the and said. They are also sometimes called high-frequency words, because they are words that are often seen even in simple stories for children. There are 40 of these words that are usually taught in pre-k, and another 56 that are often taught in kindergarten. And another aspect of balanced literacy is something called phonemic awareness. Kim Burnim: It’s a complicated-sounding phrase for something that’s really very simple: the ability to identify separate sounds in words. For example, when you hear the word “cat,” you probably can identify three different sounds in that word—the sound of the c, the sound of the a, and the sound of the t. Or to put it another way, you are aware of three different sounds. Language experts call each of the different sounds that appear in spoken words phonemes, so when you can identify the three phonemes in the word “cat” you are showing that you have phonemic awareness. 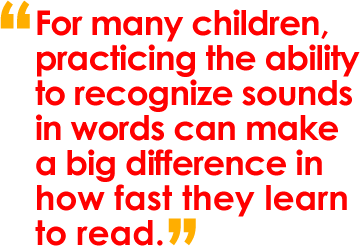 For many children, practicing the ability to recognize sounds in words can make a big difference in how fast they learn to read. A child can practice phonemic awareness by listening to and reciting pieces that rhyme, such as songs, nursery rhymes, other poems, and rhyming stories. This is why we include all of these things as part of the curriculum on ABCmouse.com. Where can parents get more help with resources and ideas for helping their children become successful readers? Kim Burnim: What you want to look for are resources that are based on well-established principles of teaching and learning, which are referred to as best practices. Best practices for teaching young children include allowing children to learn new things in many different ways (such as through songs, books, art activities, puzzles, games, and other hands-on activities), making learning fun and playful, and lots of repetition. Thank you, Ms. Burnim, for helping parents better understand such an important topic! Kim Burnim: It was my pleasure. Helping children learn has always been my passion. 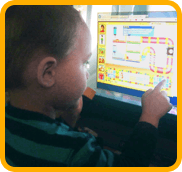 To view Kim Oliver Burnim’s parent webinar All About Phonics, click here. Center for Early Literacy Learning Review: Relationship Between Young Children’s Nursery Rhyme Experiences and Knowledge and Phonological and Print-Related Abilities.